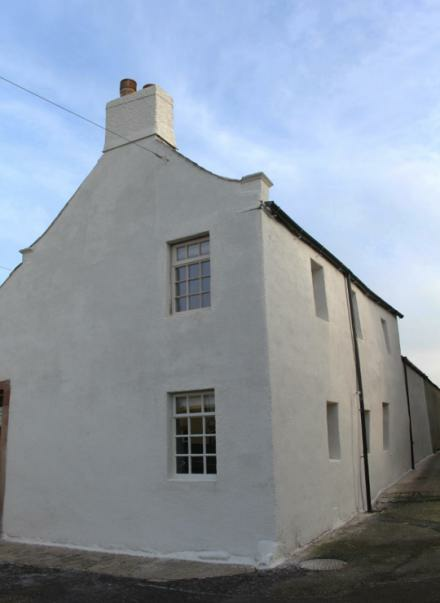 llias Igoumenidis from Ecological Building Systems discusses how thermal plaster has helped to transform a derelict 19th century cottage in the Cumbrian village of Allonby into a desirable holiday retreat. When Steven Wooldridge and his son Luke bought Glen Cottage with the aim of transforming the dilapidated property into a haven for holidaymakers, he knew it would be a labour of love to bring the cottage back to life without compromising any of its original character and charm. ‘It’s one of the oldest houses in Allonby, on the West Coast of Cumbria’ Steven explains, ‘and was owned for many years by the late eminent local artist, Percy Kelly. We really wanted to keepthedistinctivefeaturesandcharacteristics of the sandstonewalls. ‘The house was very damp because moisture was trapped by the external cement render so we decided to remove this and replace it with a‘breathable’ plaster. We wanted to use materials that are sympathetic to how the walls should perform and were very lucky to find Ecological Building Systems. solid walls and combines excellent thermal performance with a hygroscopic capacity that absorbs and dissipates humidity, preventing the potential for condensation and mould. The Diathonite Evolution thermal plaster used as part of a combination of breathable solutions from Ecological Building Systems at Glen Cottage is based on a Diatomaceous earth formulation, leveraging the high porosity of this naturally occurring mineral which is capable of absorbing up to 1.5 times its own weight in moisture to provide high levels of capillarity. Diatomaceous earth is combined with cork particles to enhance thermal resistance and sound absorption, naturally porous and lightweight aerated clay and NHL 3.5 lime, which provides a hydraulic binder for the thermal plaster. Diathonite Evolution was used as the insulation and resurfacing plaster for both the internal and external walls. 50mm of Diathonite was applied internally and 30mm externally, improving the U-value from to 2.5 W/m²K to 0.45 W/m²K. The contractors engaged to carry out the project were experienced in the use of lime renders for heritage properties but had never used the Diasen product range before, so Ecological Building Systems provided training and an induction into installation best practice and product uses and performance. Work then began on refurbishment of the two storey cottage’s interior. After stripping out the existing dry lining, a new damp proof membrane was installed under the slab and cut flush to the top of the slab and Diasen Watstop, an epoxy waterproofing system suitable for internal or external use, was applied by brush above the slab in continuity with the membrane to create a tanking system that will prevent moisture from passing through the walls from the outside since the internal slab is 30cm on average below ground. The Diasen Watstop was allowed to cure until it was semi-dry so that the tacky surface would provide a key for the Diathonite plasters. To provide a salt barrier and enhanced dehumidification at Glen Cottage, Diathonite Deumix+, a cork-based thermal insulation plaster which includes NHL 5 as oppose to NHL 3.5, was applied to the internal walls in more challenging areas from the level of the slab to 500mm above the top line of the tanking system in a 25mm spray applied layer. Watstop is essential in this case because it is below ground level to optimise the performance of Diathonite Deumix+ and the robustness of the whole system. Watstop creates a buffer by preventing Diathonite Deumix+ from being saturated if large amounts of moisture penetrate the wall, hence ensuring the capillary action of the Diathonite Deumix+ is maximised.” The Diathonite Evolution was spray-applied in two 25mm layers and this was then floated by hand to provide a smooth internal wall surface, following the contours of the original walls. Once the Diathonite plaster was fully dried 10–11 days later, a breathable lime based finishing render was applied directly onto the plaster in two coats. Externally, stripping back the mouldy and discoloured render revealed rubble sandstone which was cleaned to remove any loose particles. 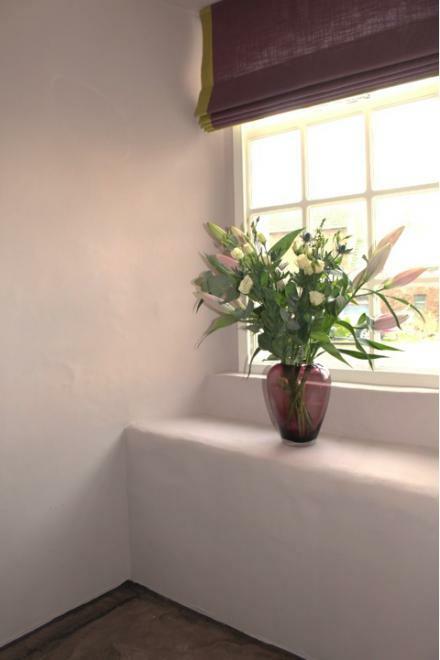 The naturally rough surface provided an ideal key for application of the plaster. For the timber lintels and window surrounds, however, Diasen Aquabond was used to aid adhesion of the Diathonite Evolution. primer for use on the plaster. The external walls were then finished with Diathonite Cork Render sprayed by hopper, a diffusion open finishing coat that provides both water repellent and anti-fungal protection to the newly plastered walls. This enabled a clean, white finish in keeping with the location and original aesthetic of the building. Glen Cottage is now completed and available to rent for those looking for a coastal retreat that combines authentic charm and a creative past with a warm, dry, quiet and damp-free interior.